Have new developments along the High Line passed their peak? After billionaire Robert Smith’s $59 million deal at the Getty set a record for Downtown Manhattan sales last year, the project’s developers upped prices. 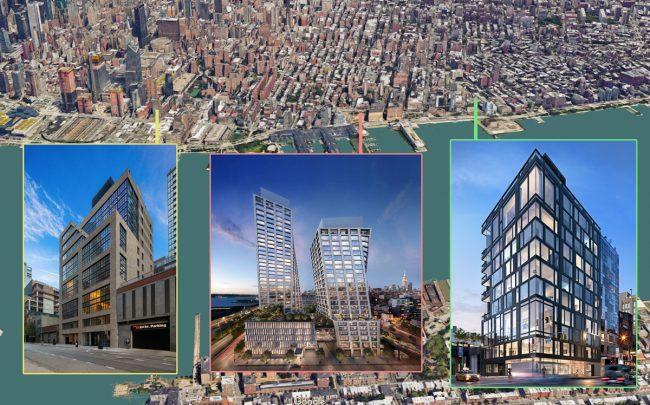 The Victor Group and Michael Shvo project — a seven-unit luxury building in West Chelsea — saw two more sales priced at nearly $30 million, which helped the developers land a $30 million condo inventory loan in February. Despite more buyer interest, however, the Getty and other luxury condos along the High Line are contending with layers of competition. Ultra-high-end projects like the Getty are tailored toward a very specific buyer pool while other lower-priced units are up against a sea of new development in other parts of Manhattan. Despite the price cuts and abundant inventory, brokers said they’re seeing more traction among buyers — but closing on deals is a much slower process. Sales at condo projects along the High Line — which stretches from West 30th Street down to Gansevoort Street — have trended in line with broader luxury sales in Manhattan. Last year, the area saw 47 recorded sales, according to data compiled by StreetEasy. That’s down from 74 sales in 2017, even as active inventory didn’t dramatically fluctuate, per the listing portal’s data. Meanwhile, as the median closing price has varied quarter by quarter, the median asking price in the area has ranged from $5.3 million to $5.9 million between the beginning of 2016 through the beginning of last year, before dipping below the $5 million mark. To some, that’s a sign of more price shifts to come. Developers looked to projects like 70 Vestry Street — Related Companies’ luxury condo building in Tribeca, which has had some high-profile sales — but the market is in a different place now, said Sean Murphy Turner, a broker at Stribling & Associates. And projects like the Getty and HFZ Capital Group’s the XI, with 236 units, are going after similar buyers. Even with the uncertainty of the pied-à-terre tax removed, the inventory has kept the pace of High Line sales relatively slow. The neighborhood has consistently had more than 100 active listings since last year, according to StreetEasy, which doesn’t include unlisted units at some of the high-profile projects. One selling point of the area is that it has been “successfully gentrified,” said Fran Katzen, a broker at Douglas Elliman. The cluster of restaurants and bars along the High Line, as well as all the residential development, has made it a more desirable neighborhood. Plus, some clients seek out the neighborhood because of its proximity to Avenues, the international private school on West 24th Street. The High Line also faces the challenge of being sandwiched between other high-end, high-demand areas, said Turner. At the southern end, buyers may be lured instead toward Tribeca and farther north, they may find the newer Hudson Yards residences more appealing. The New York Times’ harsh architectural review of Hudson Yards has actually spurred more client interest, Turner said. A previous Crain’s New York report, for example, noted that only 16 of 39 units at Related’s 520 West 28th Street sold. Fourteen of those units at the Zaha Hadid-designed building traded in 2017. Meanwhile, in January, Nest Seekers’ Ryan Serhant took over sales and cut prices at Cary Tamarkin and High Line Development Group’s 550 West 29th Street. Part of his marketing strategy included coining the 19-unit project SoHY — as in South of Hudson Yards and pronounced like “so-high.” The mix of three- and four-bedroom units will be priced in the “low $3 million range to $7.5 million,” and more units will hit the market as sales are made, Serhant said at the time. Sales for the condo first launched in fall 2017 with prices ranging from $4.6 million to $13.5 million. There are more prices changes to come, Katzen predicted, but brokers have to strike the right balance. But some price cuts will be necessary to stay competitive. In the broader Manhattan condo market, the listing discount widened to 8.8 percent in the first quarter from 4.4 percent a year earlier, according to Douglas Elliman. And as sales fell 3.2 percent year over year, the entry threshold to the luxury market also dipped 3.2 percent to $3.825 million. To Shemesh, it’s simply a matter of time. Slashing prices 20 to 30 percent will always bring in more deals, but that’s not in the best interest of the project or the developer, he said. Heading into the spring and summer seasons, he hopes that less uncertainty about the market and smaller price adjustments will help seal the deal for those interested in ultra-luxury condos in the neighborhood.